[prMac.com] Bellevue, Washington - Eltima Software recently introduced the beta version of their new app for Mac OS X - Elsewhere: ambient nature sounds. Elsewhere enwraps you in a natural environment sounds giving the possibility to either concentrate on work or totally relax. Elsewhere is a simple program not loaded with unnecessary settings and has a compact interface. It works in the background not interfering with the working process of the computer user and can be easily paused if necessary. 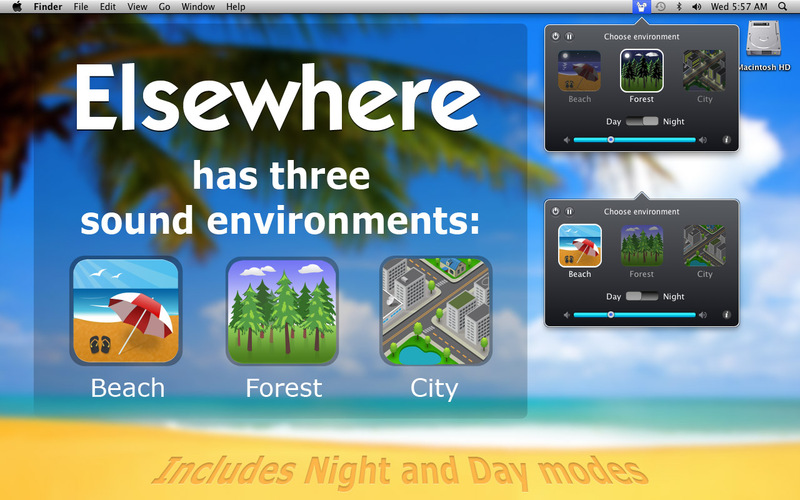 Elsewhere version 1.0 offers three realistic ambients: Beach, Forest, and City. Elsewhere has the unique feature of determining the dusk and dawn time in your time zone and adjusting its sounds to the time of the day automatically. The sounds are even more realistic as they correspond with what you see through the window. The sounds are random and played at various intervals, which takes you as close to where you'd like to be as possible. Currently Elsewhere is available as a free beta and can be downloaded from the publisher's website. In future it will be available through the Mac App Store. Eltima Software develops Mac applications for more than ten years now and constantly expands their range of products for this platform. Eltima Software is a global software Development Company, specializing primarily in serial communication, mobile and flash software for Mac OS and Windows. Eltima Software delivers top-notch solutions having a friendly team of 40 professionals. Copyright (C) 2012 Eltima Software. All Rights Reserved. Apple, the Apple logo and Macintosh are registered trademarks of Apple Inc. in the U.S. and/or other countries.